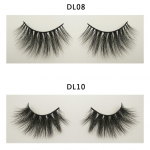 Hey everyone, today I want to bring you a very good news ——- we have launched 5 new styles 3D mink eyelashes, 25mm DL-style series. 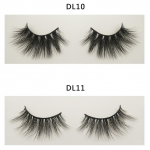 The DL-style series consists of 5 pairs different eyelashes, DL22, DL04, DL08, DL10, DL11; you may think that DL22 and DL04 are familiar, yes, good eyes . they are similar to DH004 and DH012, because DL22 is based on DH004. Reconstructed, DL04 is modified on the basis of DH012. 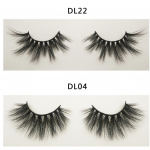 The remaining 3 pairs different 25mm lashes are newly designed. We always follow this design rule, aren’t we? Now welcome the beauty Come and leave a message who loves the DH-styles.